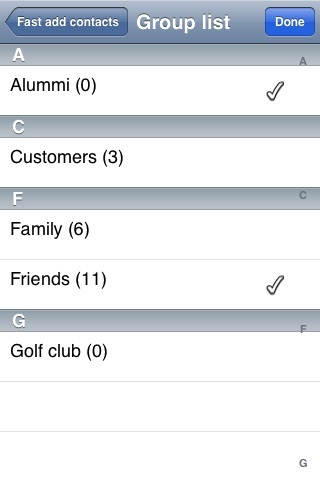 Basic version: Assign a new contact to one or multiple groups. 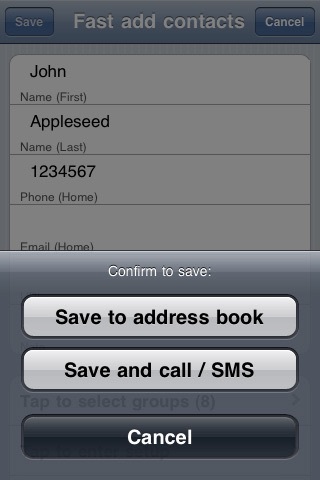 Enter all the contact information in a single screen, no need to switch between screens. 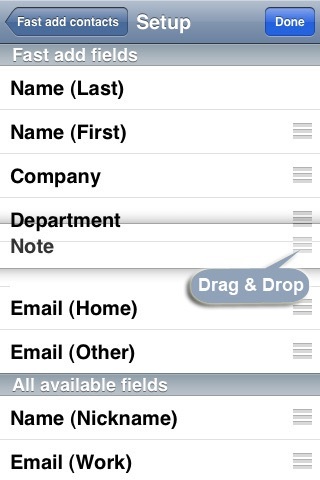 Advanced version (In app purchase $0.99): Drag & Drop entry fields’ setup (including reordering). Up to 25 available fields to choose from, you decide what fields appear when App launches. - Save a new contact and then immediately call,SMS or email. - Auto save: If you close the App, it saves what you are typing so you can save the information later. - Auto scroll: The screen will scroll as you move from field to field. - No status bar: You get more space. - How do I save the Setup information? In order to keep the Setup information, you need to add a new contact with at least one field. Then the Setup will be saved automatically. - How do I save a new contact to address book? - How do I save the contact when I set the last field as phone number? The number keypad does not have a Done button. Please send us emails at [email protected] if you have any questions or comments. We listen to you and support you.